Lamp holder SR1310, 360°, E27, white, 240VAC, for LED, plastic, motion sensor Plastic lamp holder with socet E27, motion sensor designed for free installation of LED lamps up to 60 W.
Motion sensor SR1050 for LED strip, surface, 12VDC, 10m, 120° Motion Detector (PIR) for LED bar, model SR1050 with control relay to turn on the tape for convenience and economy. Mini Proximity Sensor 12VDC, 24W, 10°, 0.05m, MSB The mini proximity sensor detects moving objects and turns on/off the load it is connected to. 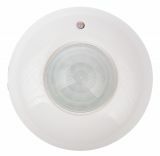 PIR Motion Detector, Brennenstuhl, PIR 240, 12m, IP44, waterproof, white, 1170910 White, infrared PIR motion detector PIR 240 from Brennenstuhl which automatically switches lamps on and off (incandescent, halogen, energy-saving bulbs and LED lamps) when someone enters the detection zone. For indoor and outdoor use with protection degree IP44. Detection angle 240° and max. range 12m. Infrared Motion Detector PIR 180, 220VAC, 1000/300/100W, 180°, IP44, white, Brennenstuhl, 1170900 Automatic infrared motion sensor (PIR) from Brennenstuhl with control relay for consumer in white color. Suitable for indoor and outdoor use with protection degree IP44. Detection angle 180° (horizontally) and 60° (vertically). Max. range 12m. Duty cycle can be adjusted between 10sec. and 4 min. PIR switch BL402, 220VAC, 500W / 300W, 140 °, 12m Electronic PIR switch with IR sensor and microphone, the luminaire switches on when recording motion or sound. 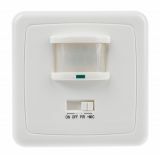 Automatic infrared (PIR) sensor, wall mount 12VDC, 15x10m, IntelliSense Automatic infrared motion sensor (PIR) with control relay. Infrared sensor (PIR) TITAN QD40 Digital PIR sensor with PI protection for 25/40 kg animals (selectable). The sensor is suitable for home users, places with high security standards and as little as possible number of false alarms etc. Automatic infrared PIR sensor, 220VAC, 1200/300/100W, 120-360°, 6m, BL401 360 Automatic infrared motion sensor / PIR / model BL401 360 with control relay for switching on of a consumer (electric appliance or lamp) for convenience and energy efficiency. Passive infrared sensor (PIR), 220VAC, 800 / 200W, 120 ° -360 °, up to 6m Passive infrared motion sensor model PD-PIR115 with control relay for consumer. Microwave motion sensor BL404 360, 220 - 240 VAC, 1200 W, (8 sec - 12 min) Microwave motion sensor BL404 360, 5.8 GHz, 360° angular detection. Automatic infrared motion sensor 220VAC, 1200/300/100W, 180°, 12m, MS02 Infrared PIR motion sensor MS02, 1200 W.
Photoelectric switch, automatic, 220 VAC, 20 A, not adjustable The device is a compact and reliable photoelectric key. It is used in the management of street lighting, plant lighting, parks, ports, airports and more. The AS-22020 operates with a rated supply voltage of 220 VAC, 50 Hz and rated current 20 A (active load). List Price 10.50лв. VAT Incl. 9.97лв. VAT Incl. 9.45лв. VAT Incl. 8.92лв. VAT Incl. 8.40лв. VAT Incl.